I can't quite believe that after about 9 months of anticipation and planning and gathering those last pieces of kit and gadgetry, that in a week's time I will be sitting in Portsmouth with the Santander ferry leaving the next morning. I've been downloading and printing maps I'll need and copying the last documents. Putting in 'Portsmouth Travel Lodge' (where I will be staying) into Google unfortunately brings up a barage of complaint about this hotel. The most enthusiastic say that it is what you'd expect from a budget place. But the strong theme is dirt, followed closely by delapidation. Another popular theme is constant noise. So I am prepared for a grubby sleepless night in an uncomfortable and probably broken bed - in other words a good preparation for two weeks camping. As long as Bertha is still there in the morning with all her bits then I won't be complaining. 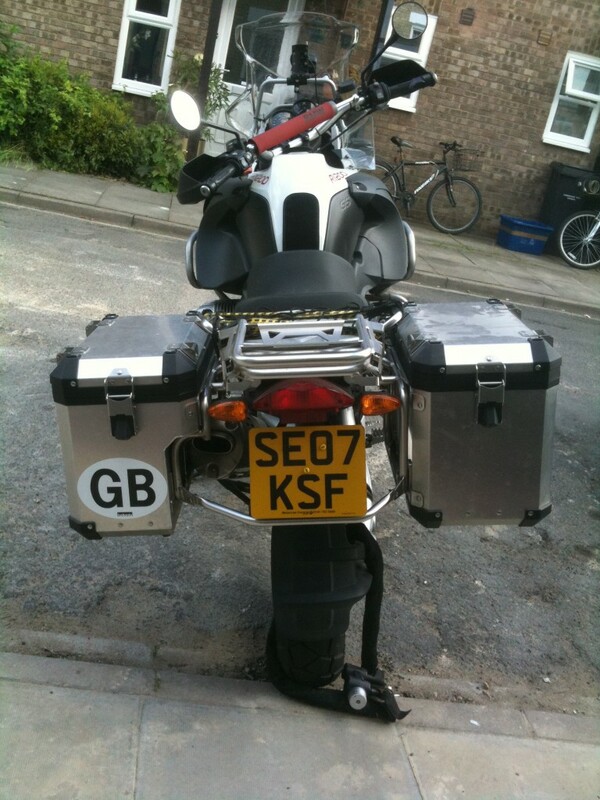 Speaking of Bertha, she now has a year's MOT and a new front tyre. I'm hoping to feel totally comfortable on her by the time I get back. I will be visiting Lourdes, seeking out the shrine devoted to leg-lengthening. Another two inches on my inside leg would make riding a 1200gs so much easier. Tonight I'm staying the the Travel Lodge about 200 yards away from the entrance to the Brittany Ferry terminal where I catch the ferry in the morning. The reviews on trip advisor said this place is dirty and falling to bits but I find it completely satisfactory, certainly not lavish but perfectly adequate and unannoying. I've discovered Portsmouth's answer to Camrbidge's Mill Road and stocked up on food for breakfast and for the ferry – including six or some other unnaturally large number of custard donuts. I'm Reading Bruges La Morte, cutting off slices of Dutch Gauda drinking Australian Merlot (which according to J F Lyotard makes me typically postmodern) and watching out of the window as more people on bikes arrive. There are five now. There is very little hair among the riders. I've often noticed this. Same place this morning a fierce sun beats into the room and I have the curtains nearly closed with just a shaft of sunlight shining in. The car park and adjoining pub filled up last night with bikes and bikers but they nearly all left early at about 6am – it woke me up. So now just three of us are in solitary splendor probably awaiting the same sailing. It will be nice to be on the breezy sea today instead of riding through hot streets. On the boat: We've been sailing for nearly three hours. 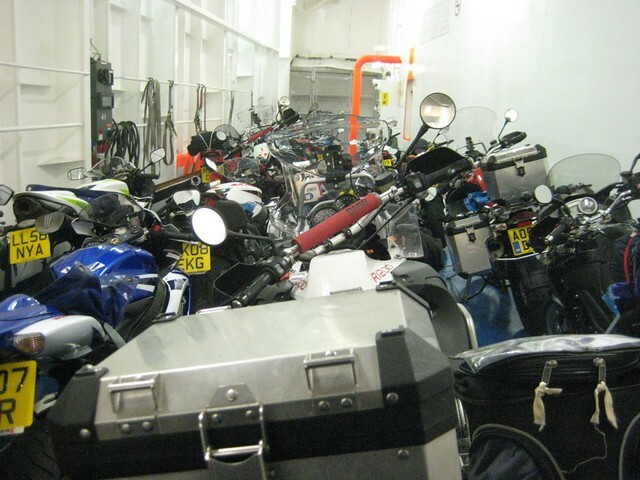 There must be 100 bikes down on the deck, crammed in and tied down. If one were to fall, they would all go down. I don't know how we will get them all out. 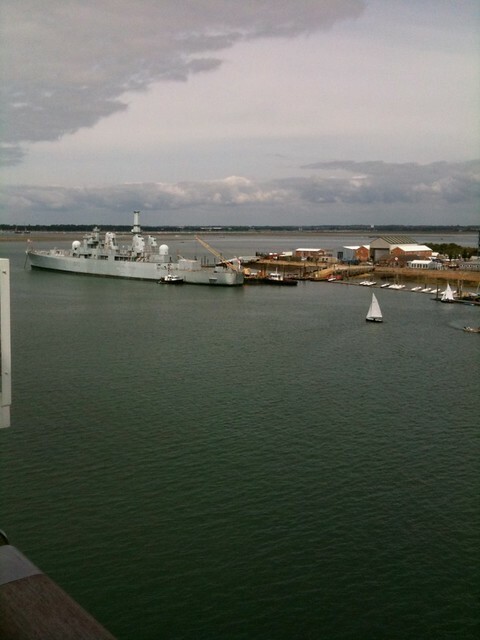 We sailed out past the sealine of Portsmouth, beautiful town in the sunlight with its renovated docks and victorian buildings. I must come back to visit some time. I wondered about the person who drives this huge vehicle and how old-fashionedly manly sea captains are, with their silver buttons and Aran polo necks. Perhaps I am thinking of Jack Hawkins films. I stood on the deck at the back with a large H on the ground for a helicopter to land on and started to feel myself move into a different space, with 24 hours on this boat with nothing to be done, not even a companion to interact with. I am savouring the slow passing of solitary time. The ship has a French flag and all the staff greet you in French then very quickly, inevitably, switch to English but they never abandon their own tongue – why should they?. The boat caters for all comers – the endless bars with loud Brits with nearly empty pints of lager in their fists even before I had climbed up from the car deck, and the spaces for the older traveler whose features are bleached of colour. 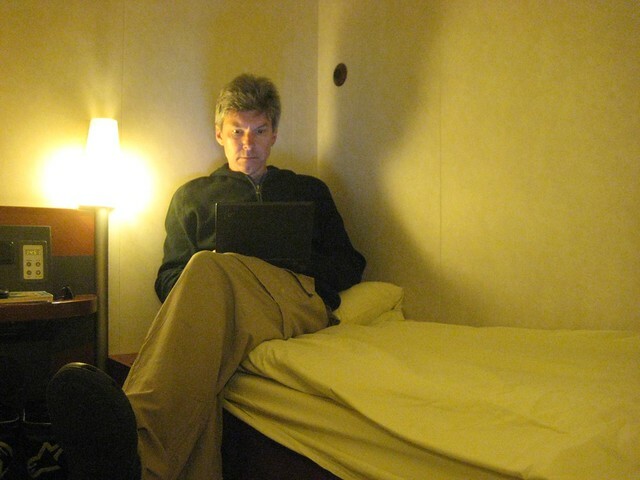 So far I've alternated between time on the bracing deck and my cosy though windowless cabin. After seeing the coastline become distant I came down here to read a little more of Bruges La Morte then fell asleep. When I woke up and went on deck an erie transformation had occurred: we were surrounded by fog and the sea had lost its sparkle. The ship's horn sounded every few minutes, ominously as in so many disaster at sea feature films (some perhaps with Jack Hawkins not showing a trace of emotion as women and children leave first on the floundering life boats and the horn sounds again). The trick will be as usual to take advantages of the ship's hospitality while avoiding the annoying and loud fellow-traveler and of course to avoid icebergs and German U-boats, and those little two-seaters that frogmen ride in dark and echoey waters to stick magnetic limpet mines to the side of our hull and give them one big wind of their clockwork timer before they speed away, under the impetus of two quiet propellers. I had one of those as a boy that I played with in the bath. The frogmen were detachable and had a life of their own, of sorts.